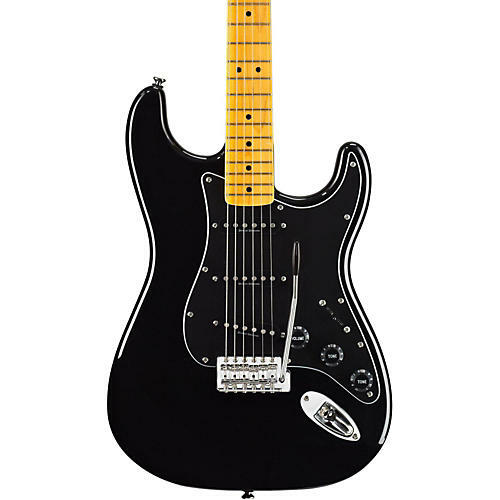 With a body based off of one of the most notable guitars in history and dressed up in black, the Squier Vintage Modified ˜70s Stratocaster electric guitar looks wonderfully familiar. Squier tweaks the classic to give it a custom look and feel. Modified means adding new twists to familiar designs. Squier's Vintage Modified series excels at just that, imparting hot-output chop-shop sound, feel and value to traditional instrument designs. The Vintage Modified Stratocaster electric guitar is constructed of basswood which has excellent sustain and a great resonance at mid and high frequencies. Three Duncan DesignedTM SC-101 single-coil pickups with black covers spruce up the look and sound of the guitar. Squier also included a maple fretboard, five-way pickup switch with black tip, three-ply pickguard, numbered volume and tone control knobs, vintage-style synchronized tremolo bridge with vintage-style tremolo arm, vintage-style chrome tuners, chrome hardware and an engraved neck plate.